Ryan Mlynarczyk and Mandy Creighton are in the middle of an 18-month journey by bike in which they are researching, partaking in, and spreading the message of sustainable living. If you are unfamiliar with the idea of sustainable living, or you simply want a better explaination of what it is that Mandy and Ryan are doing, I encourage you to watch the short video below. After the video is over, continue to scroll down and read the interview I conducted with Ryan and Mandy about their epic bicycle adventure and documentary project. First of all Mandy and Ryan, where are you from and what do you normally do? What was life like before you left on your trip? What is “normal” really? Well, prior to devoting our lives to living the nomadic life by bicycling 12,000 miles around the US, Mandy spent her time in the Midwest primarily focused on non-profit development and support for small business start-ups. Ryan spent most of the last 30 years near the San Francisco Bay Area, and prior to the trip had been focusing on environmental activism and professional wedding photography. In order to invest ourselves fully into a more sustainable lifestyle, we chose to quit our “corporate” jobs, sell our cars, and live an alternative lifestyle in the loft of a barn at Laguna Farm, a CSA (community supported agriculture farm) for about eight months. During this time, we did worktrade on the farm to earn a place to live and a box of fresh locally grown veggies each week. We also worked hard on www.withinreachmovie.com, lining up corporate sponsorships, obtaining necessary cycling gear, and getting the word out about our non-profit film project. In addition, we cycled over 2,000 miles during these eight months to prepare our bodies for the road ahead. Can you explain what exactly you are doing and how your bike trips is different than most? Our Mission is to film and document how sustainable communities function throughout the United States. We are “bikepacking” to the East Coast and back to California, using solar-powered electronics and several different styles of leg-powered bicycles. The result is a feature length documentary film that will present a realistic experience of seeking out and living in a sustainable community. Our bike trip is different than most because we’re self-supported, and therefore we carry all the typical gear used on a bike tour (tent, sleeping bag, clothing, food, etc.) and in addition, all the gear to film a documentary and maintain a resourceful website. This includes professional camera gear, laptops and hard drives to back everything up. In addition, our trip is unique in that we are riding a variety of bicycles and trailers and ways for carrying gear, including an in-line tandem recumbent, which we swapped out for the ‘bicycar’ (quadribent or side-by-side tandem recumbent), and are now riding two Novara Safari touring bicycles. At one point, we also used a solar powered electric assist bike trailer with pop-up sleeping tent (that we invented and built), and a small plastic tub trailer. For the next leg of the tour, we’re going ultra light and have ditched the trailer and opted for less gear. How do you two know each other? What is your relationship? And have you been getting along? We met in 1999 during college on an eco-mission trip to Central America, and became fast friends. We had been out of touch for most of the last ten years, but the universe brought us back together. After several months of phone and email time, we realized we were destined to share more than a friendship, and we are now engaged to be married at the end of the journey. We figure, if we can make it through 12,000 miles on a bike, we will be prepared for marriage! We’ve certainly experienced some tremendous joy, as well as some tough challenges. Bicycling and living on the road requires an immense amount of time and effort, then add in creating a movie and making the necessary connections along the way to gather excellent footage and you’ve got more work than two people can possibly handle. Thus, we’ve experienced a fair amount of stress, leading to the occasional energetic disharmony, need for space and most recently, the decision Mandy made to bike ahead about a week to go on a personal retreat. Because we decided on such a long tour (18 months), we realize that it is healthy to take a day here and there to get some space from one another. Most people don’t spend as much time together in an entire lifetime as we have in the first 4 months of the tour. Fortunately, we are not only lovers, but best friends, co-workers and in the same sangha, or spiritual community. Therefore, we also share an incredible amount of joy as well. 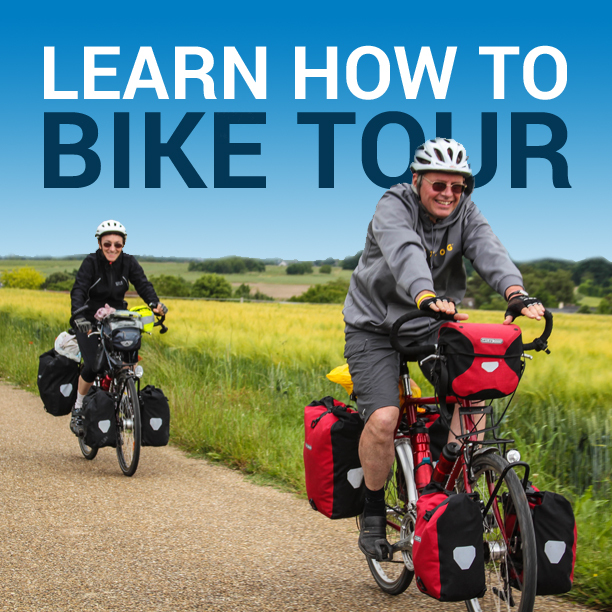 How exactly did you first find out about bicycle touring? Or “bikepacking” as you refer to it. Ryan went on his first bikepacking tour along the Oregon coast with Common Circles Expeditions in January 2005. Read his photo-blog about this trip here. Both of us have owned bicycles our entire lives and had dreamed of going on an adventure of this nature. However, neither of us had much experience at all! Thus, we decided to go car-free for about a year prior to hitting the road for Within Reach. This conditioned our bodies and by the time we departed on October 5, 2007, we had each already put in about 2,000 miles of bicycling just around town, and several 100-200 mile long weekend bikepacking trips. We call it bikepacking because it is self-supported and we pack all our own gear, similar to backpackers. Why did you decide to give bicycle touring a try? And why did you decide to go where you did? It is imperative that each of us reduces our carbon footprint in the way that works for us. This is the best way that we saw this to be possible. It’s different for everybody, but neither of us are very, um, good drivers to be honest, and we just feel safer and more healthy on bicycles vs. cars or trucks. We decided to tour 12,000 miles around the US to visit sustainable communities and make a documentary film because we believe it is important to make a difference at home. Trust us, we’ve often thought about taking our presentation and film project to Mexico, Central America or other far-off places, but the reality is, there is plenty of work to be done, and inspiring stories of hope to be shared in our own “backyard”. You talked about this a bit already, but what type of bike and gear (trailer, panniers, etc) are you using and why did you select those particular items. We initially took our own invention of a solar-electric power assist bike trailer with pop-up sleeping tent for two, pulled by an in-line tandem that was donated to the project. You can watch a short film about this unique project here. However, the trailer proved to be just a prototype and quickly went back to the engineers for further testing and refinement, and the bike was just not sturdy enough for a ’round-country tour. So, we then switched to two Recumbents donated by Raines Cohen, and a BicycleR Evolution trailer found on craigslist in San Francisco. Throughout, we’ve held fast to our Novara waterproof panniers which are AMAZING. They are completely rainproof, and not rigid, thereby easy to pack and carry odd-shaped items. In addition, we are sponsored by Lowepro, who has provided us with padded camera bags. These work GREAT for bike touring! Some of them even strap nicely to the handlebars for easy-access items such as lip balm, mace spray and the iPod shuffle. We use these bags for just about everything you can imagine – one is even used for our bathroom kit. As is typical of lengthy bike tourers, we have consistently downsized our gear at each major city. We started with about 200 lbs of gear (we were weighed at a truck scale! ), then down to 125 and we are now down to about 110 lbs (55/each) and we will probably stick to that for the remaining 9,000 miles of the tour. Are you traveling with any cool/neat items/electronics/toys that are worth mentioning? We are on a journey toward sustainability, and we believe strongly that the movement is aided by “appropriate technology”. We consider the Internet part of this (it has even been described as the new telepathic communication! ), and thus, we each carry a laptop to keep in touch with the “outside world”. In addition, we are sponsored by Solio and Real Goods, each whom have provided us with really cool lightweight solar panels to charge cell phones, iPod and AA/AAA batteries for our lights. One of the neatest items donated to us is our Reelight battery-free safety lights that attach to the hub of each of our wheels. These are a “must have” for anyone whether you’re touring or not. Of course, we also carry an “all-in-one” phone device; and after much research, our friend/technical consultant Arsen Yeremin suggested the htc Mogul by Sprint. It serves as our phone, text messages (including Twitter Texts), GPS, road-side internet access and also has a “phone as modem” feature that allows the cell phone to send a wifi signal out so our laptops can access the internet anywhere there is cell service. What did your family and friends think about you leaving on such an epic bike ride and shooting this documentary? Did they think you could do it? Were they nervous? Excited? Scared? Friends and family…ahhhh. They are all supportive in wildly different ways, ranging from giving sound advice such as recommendations on places to stay as well as gear to bring, etc. to simply sending positive energy and prayers. Of course there is concern and fear as well. Close family members and friends have expressed their desire to have us reconsider going on or continuing the tour because there is too much risk associated with it in their minds. However, they also realize that their fears are rooted in naivete – a lack of knowing what it takes to ride a bike 12,000 miles. Don’t we all tend to have fears of the unknown? We understand their concerns and do our best to keep in good communication via phone calls, emails and even a Twitter feed on our homepage with almost a play-by-play of where we are and what we’re learning. What is the best place you have been thus far? Why? We are asked this question so often and it seems to change as we progress! The most peaceful camp spot was in Lemon’s Gap – on the Southern Tier ACA route between Marathon and Longfellow, TX. The sky was SO BIG and I’ve never seen so many stars. At one point Ryan woke up in the middle of the night and went outside the tent where he felt the most darkness and quietness he’d ever experienced in his entire life. After having bicycled through San Francisco to Los Angeles to Phoenix to Tucson to El Paso…the true peace found in West TX was a welcome change. Our favorite Sustainable Community we’ve visited so far on the bicycle tour is probably Sonora Co-housing, in Tucson, AZ. They are an amazingly open, fun, and caring community of people, who balance incredible use of their minds and their hearts. Their infrastructure (buildings, landscaping, pools, pottery rooms, gardens, etc.) are aesthetically beautiful and incredibly well thought out. What has been the best experience of the trip thus far? We keep a small journal with us in which we write down Miracles and Manifestations. In the front half, we log every “miracle” we experience on the road, and in the back, we log things that we hope to “manifest” for the journey and the world. The miracle that stands out to me is our most recent addition of Joanna Perry-Folino as Associate Producer of Within Reach Movie. We were in Austin, and after a couple days of stressing out about our low bank account, inefficiency of our “bicycar” (the side-by-side tandem recumbent we rode for the first 2,000 miles), and just having a generally low day, we finally received confirmation that this amazing filmmaker we met back in Berkeley, CA wanted to contribute financially and energetically to the project! What has been the biggest surprise thus far? What is the biggest thing you have learned? We are both surprised that we’ve made it over 2,000 miles. We believed we could do it, but when you actually get out on the road, trusting the universe to get our needs met, trusting our bodies to get us from place to place, that’s a whole different story. So I guess we’ve learned that we now speak the language of possibility. Nothing is impossible. How much is the tour costing you per day? How much have you spent? Because we are a non-profit film project, accepting donations, we keep record of our monthly budget and post these reports here. So we spend on average about $1,500/month. This figures to about $50/day for the two of us. This includes $20/day for food and the remainder spent on cell phone bill, gear replacement (i.e. tires and tubes), the occasional movie (we’re filmmakers after all! ), and paying a film editor. Thus, since we departed on October 5 (about 5 months ago), we have spent about $7,500. If you had just one piece of advice for someone who was new to bicycle touring, what would you tell them? You can do it! Anyone can! Mandy has had chronic asthma for her entire life and recently conquered it through natural remedies and exercise. Ryan, who has a bad back, has learned to take better care of his body and he’s out there every day biking wherever he goes. If you had just once piece of advice for someone who as interested in learning more about sustainable communities/sustainable living, what would you tell them? Visit www.withinreachmovie.com and click on CommuniMedia and Resources. There are literally hundreds of communities in the United States doing things more sustainably, ranging from ecovillages to cohousing to entire towns making the transition toward sustainability (check out Transition Towns). There’s something for everybody, whether you want to share income or simply share a lawn mower. You’ve still got a lot of your tour left. Are there any parts of the tour you are really looking forward to? We are both really looking forward to visiting The Farm in Tennessee. It is one of the original “communes” from the 70’s and one of few that is actually still around. There is also, Earthaven Ecovillage in North Carolina, which our ecovillages mentor Diana Leafe Christian lives, and several other rural ecovillages that excite us, since that is the style of community in which we are most interested in living after the tour wraps up. We also have many more friends and family around the country with whom we are excited to visit. And finally, what do you plan on doing once your tour comes to an end? When the tour wraps up, we hope to join one of the Sustainable Communities that we visit. We will then spend about 6 months in post-production, editing the hundreds of hours of footage to create a feature-length documentary. We’ll then submit it to film festivals and probably end up going on some sort of tour again to promote the film (although we’ve discussed going on a “Skype” tour from our living room instead of back on the bikes right away!). This entry was posted in Bicycle Touring Pro Articles, Featured Articles, Interviews, Lifestyle, Main Articles, Videos and tagged bicycle documentary project, bicycler evolution, bikepacking, common circles expeditions, documentary film, epic bike tours, lowepro, Mandy Creighton, oregon coast, reelight, Ryan Mlynarczyk, sustainable communities, sustainable living, within reach. Haven’t been there yet myself, but they do tours and it might be worth checking out. Best of luck! Yes! Ecovillage at Ithaca is one of the top destinations on our list. They supposedly have local currency really figured out. Check out the “ROUTE” page on our website for other stops on our tour. I just came across this today. What is the update on the movie and your lives since this remarkable journey?